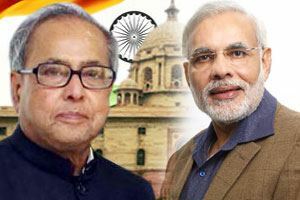 New Delhi : President Pranab Mukherjee and Prime Minister Narendra Modi Thursday greeted the officers and the troops of the Indian Army on the 67th Army Day, and said they "ensured protection of our territorial integrity" and "fought the scourge of terrorism". Extending his greetings to officers, soldiers, veterans, civilians, ex-Servicemen and their families, President Mukherjee said: "Our army has consistently displayed the highest standards of professionalism and excellence in every task entrusted to it." "It has ensured the protection of our territorial integrity, fought the scourge of terrorism and provided succor to fellow citizens in times of natural calamities," he added. The president expressed confidence that the Indian Army "will continue to meet challenges with confidence and address them with distinction, keeping in view the best interests of the nation". "I also pay my respect to all those gallant soldiers who made the supreme sacrifice in the line of duty and will remain the pride of the nation," Mukherjee said. Saluting the "indomitable courage and valour" of the Indian Army, Modi said: "On Army Day, I salute the indomitable courage and valour of our army. We are extremely proud of their dedication and determination." All three Service chiefs - General Dalbir Singh Suhag, Admiral Robin K. Dhowan and Air Chief Marshal Arup Raha - paid tributes at the Amar Jawan Jyoti here at India Gate in the morning. The day commemorates the appointment of Gen (later Field Marshal) K.M. Cariappa as the first Indian Commander-in-Chief of the Indian armed forces in 1949.